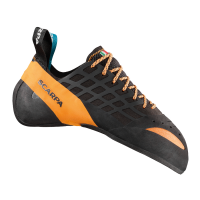 The Scarpa Instinct climbing shoe is for climbers who want one shoe for all styles of climbing. 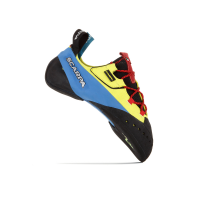 The updated Instinct lace offers a performance fit on a curved, asymmetric last with a micro suede synthetic upper and a welded overlay. Performance is enhanced with a high degree of pre-stored power in the Bi-Tension Active Rand, which pulls the sole up and back onto the forefoot for a precise, low profile fit. The Instinct VS heel is now incorporated into the lace version. A very supportive shoe! This product is available for online ordering only, not available in-store. Main photo is Black/Orange.